Departing from Los Angeles, Silversea Cruises’ luxurious all-suite Silver Whisper just embarked on the line’s World Cruise. The 121-day voyage will feature the enchanting islands of the Pacific, the timeless wonders of Asia and marvelous Arabia before concluding in Rome, Italy in May. "With World Cruise 2018, we are pleased to continue our tradition of creating spectacular world voyages that spotlight some of the most fascinating places on earth, while ensuring guests enjoy the incomparable onboard comforts and luxury of Silversea," said Roberto Martinoli, Silversea's CEO, in a press release. Prior to guests boarding the ship, a gala bon voyage dinner kicked off the grand voyage accompanied by live orchestral music at the Montage Hotel in Beverly Hills. 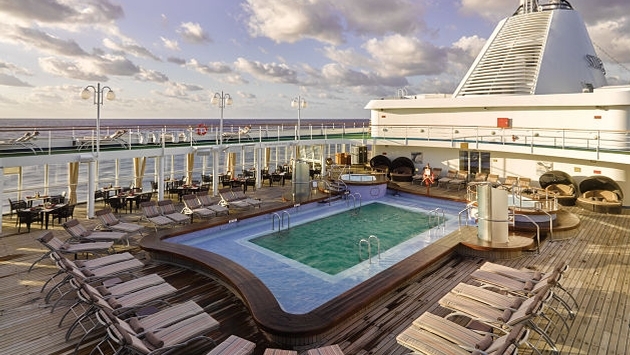 It was just one of several complimentary experiences for World Cruise passengers including another seven special events planned in Tahiti, Melbourne, Hong Kong, Ho Chi Minh City, Bangkok, Mumbai and Sorrento. In Melbourne, guests will be treated to a private evening performance and conversation with one of Australia's most popular female vocalists, award-winning Kate Ceberano. Regional delicacies await at the Verandah Restaurant at The Repulse Bay hotel in Hong Kong along with a traditional Chinese arts presentation. In Sorrento, a finale gala dinner will showcase musical entertainment at the Grand Hotel Excelsior Vittoria capped with al fresco dessert and fireworks. The iconic cliffside property is magnificent overlooking the ocean below and will surely make for a stunning backdrop to the evening display. These are just some of the high-profile inclusions guests will enjoy. Meanwhile, the Silver Whisper received an upgrade this past December. The improvements are part of the line’s fleet-wide renovation program that began at the end of 2016. Public spaces have been redesigned to mimic the new Silver Muse including the Observation Lounge, Panorama Lounge and La Terrazza. For those not onboard the current global journey, Silversea is already planning for its World Cruise 2019 dubbed "The Tales of Tales.” At 132 days, it will be even longer, heading from San Francisco to London onboard the Silver Whisper. Along the way, passengers will visit 52 ports in 31 countries and five continents and enjoy 16 overnight stops and many late-night calls. Nine writers will be invited onboard to convey the drama of the voyage in short story form. The narratives will be collected and collated into an anthology of the cruise. Already set to join are travel writer, novelist and winner of the James Tait Black Prize for Fiction—Paul Theroux—as well as novelist, travel writer and essayist since 1986 for Time magazine, Harper's, The New York Times and The New York Review of Books—Pico Iyer. For more information on World Cruise 2019, visit https://www.silversea.com/destinations/world-cruise/world-cruise-2019.html.